SV 80 General Purpose Accelerometer 100mV/g The SV 80 accelerometer is an ideal choice for walk-around vibrations measurement in the rugged environments of industrial machinery monitoring, such as pumps, motors or fans. It uses the industry standard ®ICP 2-wire voltage transmission technique with a 4 mA standard constant current supply. Signal ground is isolated from the mounting surface to prevent ground loops. Annular shear mode design prevents from thermal transient and from spurious signal from high transverse vibrations. 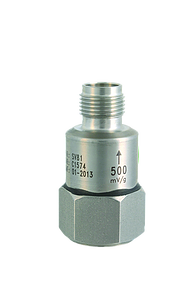 Low noise electronic and a temperature compensated design gives the accurate result over the complete temperature range. SV 81 General Purpose Accelerometer 500 mV/g The epoxy sealed piezoelectric accelerometer model SV 81 is used in the petrochemical, machine tool, and paper industries for monitoring of slow speed agitators, cooling towers, etc. It incorporates a low-pass filter within the conditioning electronic. This filter attenuates the sensor mechanical resonance and the associated distortion and overload. Annular shear mode is less susceptible to transverse vibrations and better immune to electronic saturation at high frequencies. 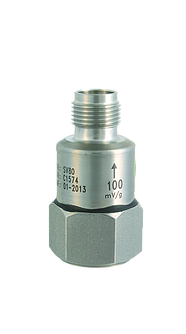 Low noise electronic and a temperature compensated design gives the accurate result over the complete temperature range. SV 84 Building / Ground Vibration Accelerometer is a hermeticaly sealed triaxial piezoelectric accelerometer designed to monitor the vibration in harsh industrial environment. Signal ground is isolated from the mounting surface and outer case to prevent ground loops. Annular shear mode design prevents from thermal transient and from spurious signal from high transverse vibrations. 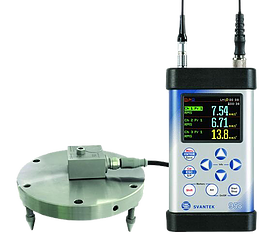 Low noise electronic and a temperature compensated design gives the accurate result over the complete temperature range. The glass seal hermetic connector protects the piezoelectric disc and the electronic from harmful environmental influences, significantly increasing their reliability and lifetime. SV 105A Triaxial Hand-Arm Accelerometer is is dedicated to Human Vibration measurements performed according to ISO 5349-2 with SV 106 six channel analyser. For in-situ checks and peridic verification of the SV 105A the SA 105 adapter (option) is necessary. The accelerometer has TEDS memory that remembers the calibration factor transferred to SV 106 instrument. Accelerometer is supplied with three adapters to perfectly match the grip of different vibrating tools: SA 150, SA 151 and SA 152. 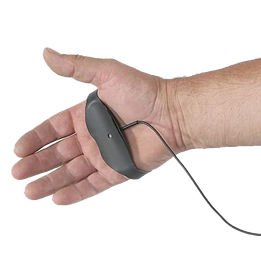 Each adapter includes an adjustable rubber strap for firm and comfortable attaching the accelerometer to the human’s hand. This solution significantly limits disturbances to the operator who doesn’t have to worry about holding the accelerometer.